Lacy Barrett Butler, daughter of Bill and Kati Barrett, and her husband Micah Butler, have opened Butler's Smokehouse, a specialty-meats business in Stephenville, Texas. Micah Butler holds a Master's Degree in Meat Science from Texas Tech University. He was a member of the 1991 National Championship Meats Judging Team for Tech and in 1995 served as coach of the team that earned three national wins. Lacy holds a Master's Degree from Texas Tech in Animal Breeding and Genetics. 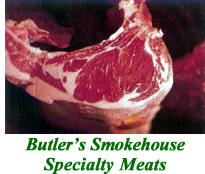 Butler's Smokehouse offers a line of specialty meat products that are handmade from their own recipes, using only the freshest and highest-quality beef and pork. Whole muscles, not parts, are used to produce their various sausages, and their jerky is made from solid strips of beef. 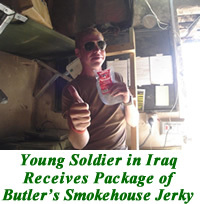 Butler's Smokehouse jerky has been sent by the USO to our troops in Iraq and other countries. They sell prime beef steaks and pork products as well as lamb chops, shrimp, salmon steaks, kabobs and other meat items, including the Dublin Bottling Works line of jerky, Root Beer jerky, and their own steak rubs and seasonings.